Custom Banners are designed by our customers. You design it, we print it. File Upload: To send us your file, go to "Upload Design" => “File Upload??? (Link at the top of every page) and upload your file. Vertical Designs: If your size is not listed (for example 6 ft tall x 4 ft wide), choose the size 4 ft x 6 ft (horizontal banner) and write in the "Customer Notes" box: "Banner is 6 ft tall x 4 ft wide." Click Here to Review Our Artwork Specifications. *Is Your Design "Print-Ready" in ACTUAL SIZE? For example, if you order a 3 ft x 6 ft (actual size) banner, your design must be 36 inches x 72 inches. DO NOT PLACE YOUR ORDER. Please make sure your design meets our 'Artwork Specifications' before placing your order. *Did You Design the Banner? *Which Computer System was the Design created in? If you are not the designer, please ask the designer before placing your order if the design is in the size (actual size) you are ordering. 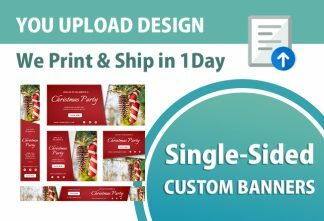 Once we receive your order, we'll design your Text Banner and email you a full color design proof (if requested) for your 'Approval' in 1 business day. Requesting a design proof may delay your order. If the banner is 3ft x 8ft (36″ x 96″), the design you submit must be 36″ x 96″. We prefer JPG files at 100-200 dpi. STEP 1: Review our Artwork Specifications. STEP 2: Design your banner in your computer. DO NOT COPY OR SCAN AN IMAGE. STEP 3: Choose your Banner Options on this page and “Add to Cart”. Proceed to “Checkout” and complete your order. You will receive an “Order ID” number instantly. STEP 4: To send us your file, go to “Upload Design” => “File Upload??? (Link at the top of every page) and upload your file. 1) Design your banner in the actual size in your computer. For example, if the banner is 3ft x 8ft (36″ x 96″), the design you submit must be 36″ x 96″. If you are not able to design in the actual size, you may design it at 50% of the actual size or 18″ x 48″ in this case. 2) Save your file as PDF, PNG or JPEG between 100 and 200 dpi. Save Adobe Illustrator or Photoshop files as version CS6 or older. Other file formats such as Microsoft Word or PowerPoint files will not be accepted. Design in CMYK or RGB color mode. 3) Convert all Fonts to Outlines. Flatten your design. No Bleed is required. Do not use “Watermarks”. 4) Maximum file size is 100 MB. 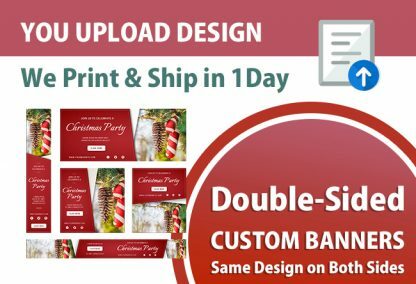 Upload each design separately. Do not upload more than one file for each design. 5) Do not link, password protect, or lock your design. 6) Remove all invisible objects outside the Design Box. 7) Do not place important text or graphics within two inches of the edges of your design due to grommet placement. Background color can cover the entire design. 8) Our system operates on Windows. Make sure Mac files open in Windows correctly. 9) If your size isn’t listed, please contact us before placing an order.